Are you more distant from your spouse than you’d like to be? Do you or your spouse waste time mindlessly viewing email or surfing the Web? Welcome to the club! 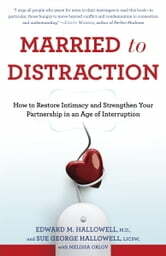 * *Modern marriage is busy, distracted, and overloaded to extremes, with ever-increasing lists of things to do, superficial electronic connections, and interrupted moments. The good news is that there are straightforward and effective ways to restore communication and connection, resurrect happiness and romance, and strengthen—even save—a marriage.